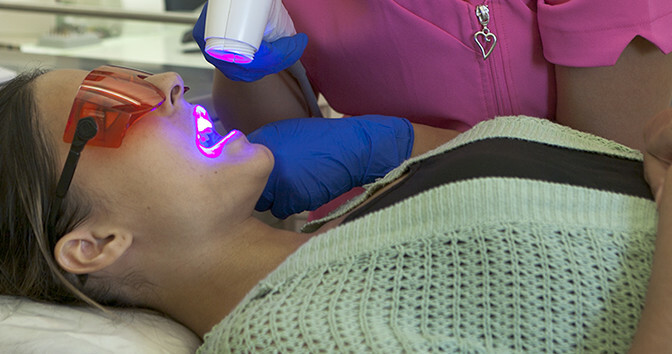 Laser Dentistry is a less invasive, more comfortable option to conventional dentistry. Healthy tooth structure is preserved with the use of laser due to its pin point accuracy. Over time, this means your teeth have a longer life span because the more natural tooth structure that is present, the stronger the tooth is. The laser produces a wavelength of energy that can cut tooth and soft tissue in most cases without local anaesthesia; however in very deep areas of the tooth where individual needs dictate, anaesthetic may be desirable. The laser is used extensively for soft tissue surgery and implant surgery reducing healing time. The laser is ideal for caries removal and tooth preparation as these procedures are carried out quickly, safely and precisely. The laser also sterilises the working area. The laser cannot be used to remove old existing amalgams (silver fillings) as it vaporises the mercury.